Seville Classics Bamboo Spice Rack Review: Get Organized Today! 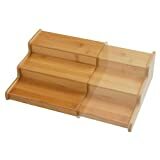 You are here: Home / Spice Racks / Seville Classics Bamboo Spice Rack Review: Get Organized Today! Are you looking for an affordable countertop spice rack? Then this bamboo one from Seville Classics should be at the top of your list. Read our buying guide packed with information to help you decide if it’s right for you. The Seville Classics Bamboo Spice Rack is ideal for kitchens with country style design. Its wooden material creates elegance in your favorite part of the house. Unlike the other spice racks you see in the market, this one has a unique step shelf design. This then allows you to see all the spices without having to take out all the bottles. And, since this kitchen gadget is wood in material, you need not worry about rusting. This product guarantees you durability. You can make sure of the excellent quality too, for many years. With this design, you can easily see which spice is needed for a particular dish you’re preparing. What makes it an excellent product is that, it is multipurpose. You can use this not just in the kitchen, but in the bathroom and bedroom, too. The wood material allows you to perfectly place this spice organizer whatever design, color, or motif it is. The Seville Classics Bamboo Spice Rack is available on Amazon. You can check now for the lowest prices on home organizers and decor. If you are an eco-friendly person, you’ll definitely love the Seville Classics Bamboo Spice Rack. This is made of bamboo so you can guarantee an all-natural and non-chemical product with this one. You don’t have to worry about your kitchen’s design either. The wooden spice rack is perfect for all designs, motifs and styles. You can also give this product as a gift for a special someone for any occasion. The receiver needs not be a cooking enthusiast to appreciate this. He can use it to organize not just the spices in the kitchen, but his toiletries in the bathroom or vanity product s in the bedroom too. This is certainly worth spending for so better grab your chance of owning it now. What are your thoughts about this spice rack from Seville Classics. Leave a comment below and let us know what you think.